sional leather jacket, a pants suit with a layered necklace. I also like to adjust my hair and makeup according to my wardrobe. But when I’m just running errands it’s definitely jeans, t-shirt and maybe a leather jacket. And I am a fan of athleisure when I’m just going to the grocery or shopping! I also try to give my skin and hair a rest on weekends, so very little to no makeup and a ponytail! 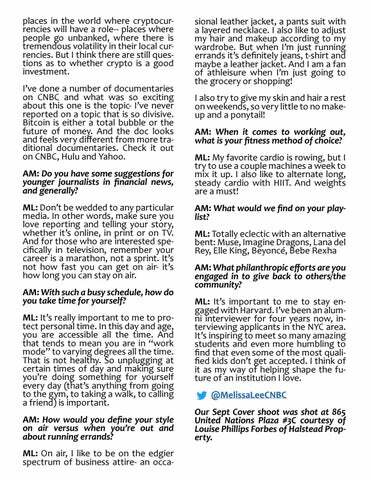 AM: When it comes to working out, what is your fitness method of choice? ML: My favorite cardio is rowing, but I try to use a couple machines a week to mix it up. I also like to alternate long, steady cardio with HIIT. And weights are a must! AM: What would we find on your playlist? ML: Totally eclectic with an alternative bent: Muse, Imagine Dragons, Lana del Rey, Elle King, Beyoncé, Bebe Rexha AM: What philanthropic efforts are you engaged in to give back to others/the community? ML: It’s important to me to stay engaged with Harvard. I’ve been an alumni interviewer for four years now, interviewing applicants in the NYC area. It’s inspiring to meet so many amazing students and even more humbling to find that even some of the most qualified kids don’t get accepted. I think of it as my way of helping shape the future of an institution I love. @MelissaLeeCNBC Our Sept Cover shoot was shot at 865 United Nations Plaza #3C courtesy of Louise Phillips Forbes of Halstead Property.